Dubai Cares invites the UAE community to participate in its 3-km Walk for Education 2012 on 17 February, 2012 along Jumeirah Beach Road, in support of millions of children around the world who face tremendous obstacles in their pursuit of education or who are altogether unable to go to school. We believe that education is the best long-term solution to breaking the cycle of poverty worldwide and we are asking everyone who shares this belief and all Dubai Cares supporters who have played a key role in spreading awareness of the work we do, to join us in our Walk for Education 2012. This event also presents a wonderful opportunity for members of the community to volunteer their time, enjoy fun activities with family and friends as well as make new friends.The walk will start at 9am. After the walk there will be entertainment and activities for all at Jumeirah Beach Park. 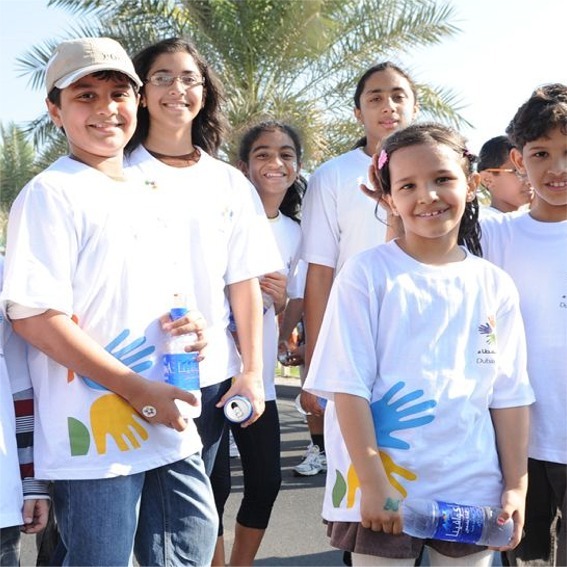 As an individual: UAE residents can register for the Walk for Education 2012 on site at Jumeirah Beach Park on the day of the event between 8am and 9am. As a group: Organizations can also participate as a group by emailing Dubai Cares on info@dubaicares.ae indicating the organization’s name and the number of participants. Participation fee is AED 30 per person and free for children below the age of five.